(NY Times Select) When I tell people I’m originally from Omaha, they often confuse it with Oklahoma or Iowa. “Omaha,” a Manhattan photographer I met the other day said. “That’s near Nebraska, isn’t it?” Omaha is one of those ultimate flyover places, an urban Podunk so vaguely situated in coastal Americans’ mental maps that the mere mention of it can actually halt conversation. Sometimes I rattle off the names of movie stars from Omaha: Fred Astaire, Henry Fonda, Marlon Brando, Nick Nolte. . . . Of course, this pantheon also implies that it is a place that requires its most exciting citizens to move on. Since Warren Buffett has become a household name, though, the city acquired a somewhat perverse new brand identity as an extraordinarily ordinary city where the most brilliant American investor and second-richest man in the country chooses to live, of all places! 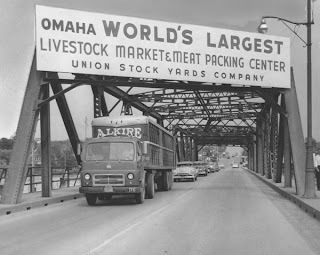 For the past three decades, I’d returned to Omaha once every year or two strictly to visit my parents, so my experience of the city had been pretty much limited to drives to and from the airport. But around 2003, I started hearing from New Yorkers that a kind of cultural awakening was afoot in my hometown. It isn’t yet Seattle or Austin, but it’s no longer some kind of Great Plains version of Hartford or Fresno, either. “Alternative” and “independent” aren’t just marketing catchwords in Omaha. The blossoming is real and multifarious. It didn’t happen overnight. And it certainly didn’t happen as a result of any grand master plan by the city establishment. Rather, it has been the improbable result of the hard work of a few local heroes. In 1968 I turned 14 and underwent the classic apostasy of the day, transforming from a stamp-collecting, Nixon-campaign nerd to a pot-smoking, antiwar muckraker. A certain grotty block downtown on Howard Street instantly became my countercultural ground zero. The neighborhood, known as the Old Market, was excitingly urban, with faded commercial signs painted on the sides of unoccupied 19th-century warehouses, entirely unlike my leafy “Leave It to Beaver” neighborhood. In one building, an art gallery and a head shop had opened. Next door was a jerry-built movie theater called the Edison Exposure, where that fall I saw my first art film — the regional premiere of Andy Warhol’s “Chelsea Girls.” Bliss was it in that dawn to be alive, and to be young was very heaven. When I left Omaha in the ’70s, the cool shops and restaurants extended only a hundred yards from the epicenter. The toehold of hip seemed doomed to remain only a toehold. If that. In 1988, as architectural preservation had become America’s happy default mode, Omaha gave ham-fisted urban renewal one last gasp: east of the Old Market, 27 fine old buildings were demolished. I sort of gave up on the place. But during the decade I wasn’t paying attention, the tide turned. The city was persuaded not to wipe away several more blocks of warehouses south of the Old Market district to build its convention center. And in the ’90s, the area quadrupled in size — building by building, organically. The main reason the Old Market wasn’t wiped away is that a single family happened to own most of the real estate. That, and the fact that the family members are not, shall we say, typical Omahans. Sam Mercer arrived in 1866 and bought up swaths of the city. His grandson, also named Sam and now in his 80s, has overseen the family interests mainly from France. On one of his regular reconnaissance trips in 1964, Cedric Hartman, a young Omahan who had gone to New York but returned and who later became a designer, suggested to Mercer that he turn his defunct warehouses into a district of stylish shops, restaurants, theaters, apartments. Back then, that was a bizarre, visionary notion; SoHo did not yet exist. Schonlau, 61, grew up in a working-class neighborhood near the Old Market with dreams of being an artist. At the University of Omaha (now the University of Nebraska), she explained, “all my professors said, ‘If you’re gonna make art, you’ve gotta leave town.’ ” After spending time in New York, she returned to Omaha in 1971, leased space for a gallery in one of the Mercers’ buildings — 12,000 square feet, $300 a month — cut up her surplus footage into artists’ studios and discovered her métier: not making art but enabling it. She turned the former Bemis Bag factory into a warren of studios and invited artists from around the world to come for residencies. Today more than 600 apply each year, and the Bemis Center occupies 100,000 square feet in two renovated warehouses. It has become, in effect, Omaha’s museum of contemporary art. Schonlau now spends most of her time overseeing the business of her husband, the Japanese-born sculptor and painter Jun Kaneko. The couple are turning another building into a “creativity museum” that’s to open in 2009. For young Americans, Omaha is probably best known as the home of a whole bunch of indie rock musicians — members of the Faint, Cursive, the Good Life, Tilly and the Wall, Azure Ray and, most famously, Bright Eyes. They play in one another’s bands, produce one another’s records and nearly all release CDs through the local Saddle Creek label. Robb Nansel dreamed up Saddle Creek as a University of Nebraska business major; it was his thesis project. He grew up in Omaha and attended Creighton Prep, the local Roman Catholic high school. Many Saddle Creek musicians, including Conor Oberst (a k a Bright Eyes), also went to Prep, as it’s called. As did the director Alexander Payne, who has set and filmed three movies here. “We’re just sort of doing things the way we want to do them,” Nansel said. Because Omaha is a cheap place to live — a 1,300-square-foot loft in the Old Market rents for $575 a month — he and his musicians are spared the financial anxiety of places like New York and L.A. “I like to believe in the concept of putting out a record because it’s good,” he said, “not to sell records.” Saddle Creek releases six albums a year and has repeatedly turned down offers to be acquired by a big label. And it has recruited musicians from elsewhere to join its happy few, its band of brothers. Stefanie Drootin, now 28, was on tour with her L.A. band in 1996 when their van broke down in Omaha. She started playing with the Good Life and Bright Eyes and moved in with a bandmate. The former Athens, Ga., band Azure Ray — Maria Taylor and Orenda Fink — fell in love with Oberst and Todd Baechle of the Faint, respectively, and moved to Omaha. “It was just a boy-based decision,” Fink joked. In short, Omaha’s cultural moment is all about the application of the great Midwestern bourgeois virtues — thrift, square dealing, humility, hard work — to bohemian artistic projects. On this, everyone agrees. “People here do business on a handshake,” said Cary Tobin, the Bemis Center’s residency program director, who was “dying to get out of here” when she graduated from high school in 1988 but returned after living in Italy and Seattle for a decade. Sarah Wilson was the assistant music editor for Interview in 2005 when she met Tim Kasher (Cursive, the Good Life) in New York. He convinced her to come to Omaha with him to write her novel. “They are workaholics,” she says of the Saddle Creek musicians. Nansel and his colleagues work so hard, in fact, that they’ve stumbled into real estate development. About a mile north of the Old Market, Saddle Creek is almost finished building a complex that will have retail space, a restaurant, apartments, the record company’s offices, a music venue and a nonprofit film art house called Film Streams. Sarah Wilson told me in December that she was moving back to New York with Kasher. “I miss the electricity,” she said. What normal 28-year-old would not? But she’s rethought her plans since. “As everyone predicted,” she wrote in an e-mail message, “the charms of Omaha are starting to wrestle me down to its frosty ground.” For now, she’s staying. Good lodging options in Omaha are fairly limited. The most stylish place is the Magnolia Hotel, which has rooms with fireplaces in a 1924 neo-Classical-style building (1615 Howard Street; 402-341-2500; doubles from $169). Most of the city’s shops, cultural attractions and bars are concentrated in this historic area of refurbished warehouses downtown. Bemis Center for Contemporary Arts Cutting-edge exhibits and artist residences. 724 S. 12th Street; (402) 341-7130; www.bemiscenter.org. The French Café 38-year-old bistro, a local institution. 1017 Howard Street; (402) 341-3547; entrees $18 to $47. Holland Performing Arts Center Modern concert hall designed by James Polshek. 1200 Douglas Street; (402) 345-0606; www.omahaperformingarts.com. Homer’s Music and Gifts HQ for Saddle Creek musicians and vintage vinyl. 1114 Howard Street; (402) 346-0264. Jackson Street Booksellers One of the very best used-book stores, anywhere. 1119 Jackson Street; (402) 341-2664. La Buvette Sophisticated wine bar with gourmet grocery in back. 511 S. 11th Street; (402) 344-8627; entrees $9 to $14. M’s Pub Busy brasserie with solid pub grub. 422 S. 11th Street; (402) 342-2550; entrees $5 to $18. V. Mertz Continental fare in a former fruit cellar. 1022 Howard Street; (402) 345-8980; entrees $25 to $43. There are more places of interest just outside the Old Market district. Goofy Foot Lodge Low-key indie rock bar. 1012 S. 10th Street; (402) 280-1012; www.goofyfootlodge.com. Joslyn Art Museum 19th- and 20th-century European and American art. 2200 Dodge Street; (402) 342-3300; www.joslyn.org. Orpheum Theater Grand old stage for local and national performing arts. 409 S. 16th Street; (402) 345-0606. “North of Downtown,” an up-and-coming area that this summer will become the home of Saddle Creek’s bar/music venue/office/apartment complex (729 N. 14th Street; www.theslowdown.com). It will also house the two-screen independent cinema Film Streams (402-933-0259; www.filmstreams.org). The area around Warren Buffett’s neighborhood also has some cool spots. 49’r Lounge Alternative rock venue. 4824 Dodge Street; (402) 554-5841. The Brother’s Lounge Microbrews and darts. 3812 Farnam Street; (402) 553-9744. A particularly good time to visit is during the (Downtown) Omaha Lit Fest (www.omahalitfest.com), which attracts writers and poets from across the country for readings, exhibitions and more. This year’s will be held Sept. 14-15. "A 1,300 sq. foot loft rents for $575 a month" - uh...where? Most of the condo lofts are in the $250,000 range. Also, it would have been nice to see the John Beasley Theater get some recognition for pulling in some amazing talent on par with the stuff that's going on in the article. Still, an overall good article for the casual observer. Exactly, where are those lofts again? Omaha, the arts Mecca of the Midwest. Here the abattoir supports the atelier, and vice versa.